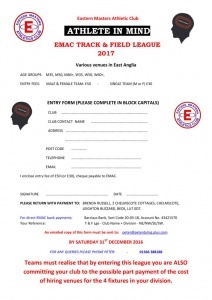 Home » News » Track & Field League 2017 – Team Entries Now! Track & Field League 2017 – Team Entries Now! The 2017 T & F League is now secure for 2017 and with sponsorship from Athlete in Mind. More details soon, but we do now need your club entries before the deadline of 31st Dec.